Cycling must be convenient and fast to be a viable alternative to the car. The Dutch achieve a very high average speed for cycling because you can cycle almost non-stop on many routes. Routes improve constantly. Traditional junctions have been replaced by roundabouts with priority for cyclists in recent years. This reduces the number of stops in the cities and that makes non-stop cycling possible. The main North-South cycle route in ’s-Hertogenbosch is one such route where junctions were replaced by roundabouts. That led to a cycle route where you have priority on every drive way, side street and junction for five kilometres until you reach the city centre 30km/h (19mph) zone. Five kilometres right of way. The video shows the route from North to South. From the edge of the city to the edge of the historic city centre. Click the picture to enlarge or go directly to this map in Google Maps. Pictures on the site of the city archive show that the route was not always like that. The streets were all built with cycling infrastructure designed in from the start. Even the street that was built in the 1930s had a separate cycle path/service street right away. Pictures from the 1930s show cycle paths/service streets next to a central carriageway. However, when you look at pictures from the early 1980s we see they have disappeared and there are parked cars where they were. 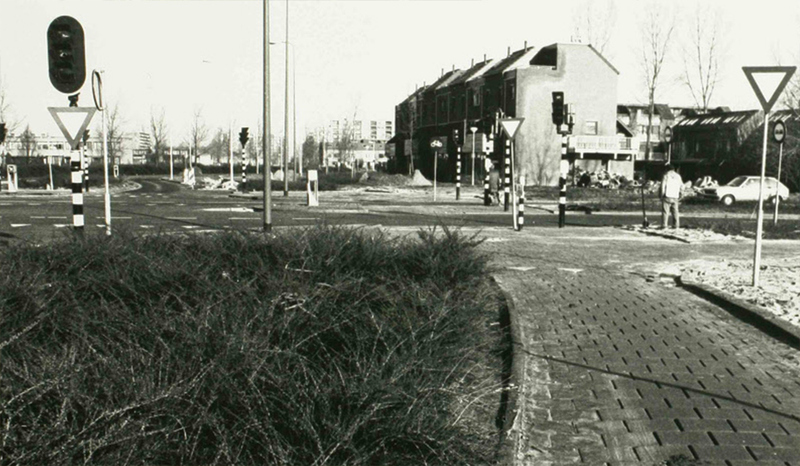 In a complete reconstruction in 1985 the cycle paths returned to their old locations. Not at the expense of parking; the carriage way was narrowed so there was still room for parked cars. 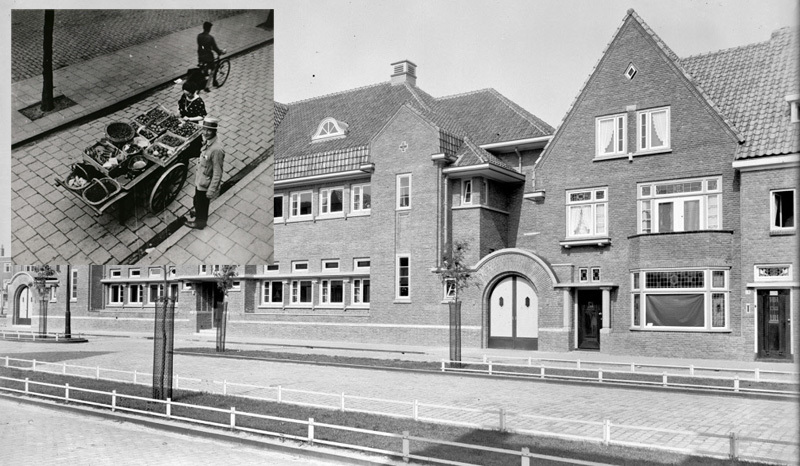 Jan Schöfferlaan in the early 1930s when it was brand new. Clearly visible the cycle paths/service streets on either side of the central carriageway. Top left a closer look at the cycle path/service street in Jan de la Barlaan (the continuation of Jan Schöfferlaan). Jan Schöfferlaan in the early 1980s. The cycle paths have gone. The carriageway was widened and parking lanes came in the place of the cycle paths. In a 1985 reconstruction they returned. The same location in 2014 shows the cycle paths . Google Streetview shows the current situation of Jan Schöfferlaan from a slightly different angle. You can see the cycle paths even better from this angle. In the area of the city that was constructed in the 1970s, the cycle paths were also designed in right from the first time the streets were constructed. Originally the cycle paths were surfaced with concrete tiles, but these tiles have been replaced by red asphalt in the 1990s. The junctions used to be traditional four arm cross roads with traffic lights, and they were replaced by roundabouts in the late 1990s, early 21st century. It was only then that non-stop cycling became possible. Because this was a gradual change, nobody seems to have noticed. Nobody calls this a “cycling super highway” or anything like it. It’s just another cycle route. There was no fanfare, no bragging and nobody used this for political gain. 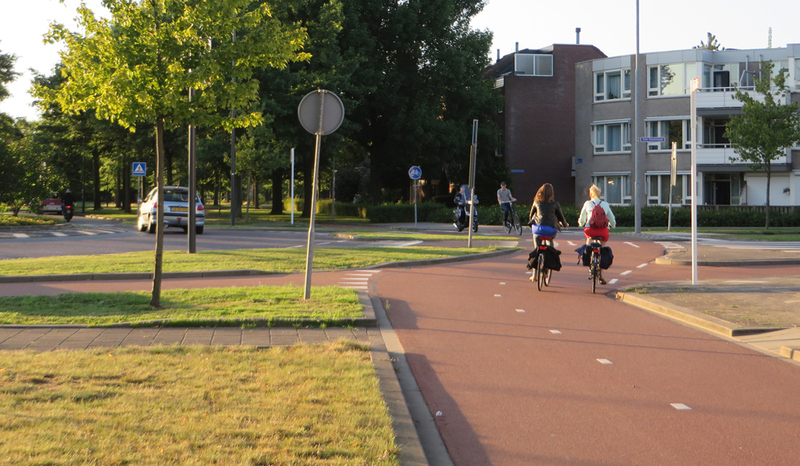 The Dutch don’t really think twice about their bicycle infrastructure, they just use it in high numbers. But they forget they can and want to do that because their infrastructure is so well-designed. When constructed in the early 1970s this was a junction with separated cycle paths. There were traffic lights and the cyclists had to give way to motor traffic. The 2013 situation. A roundabout with a separated two-way cycle path with priority. The first video is the full 5 kilometre route in very high-speed. The second video is the full route in normal speed. Full 5 kilometre route in under four minutes. 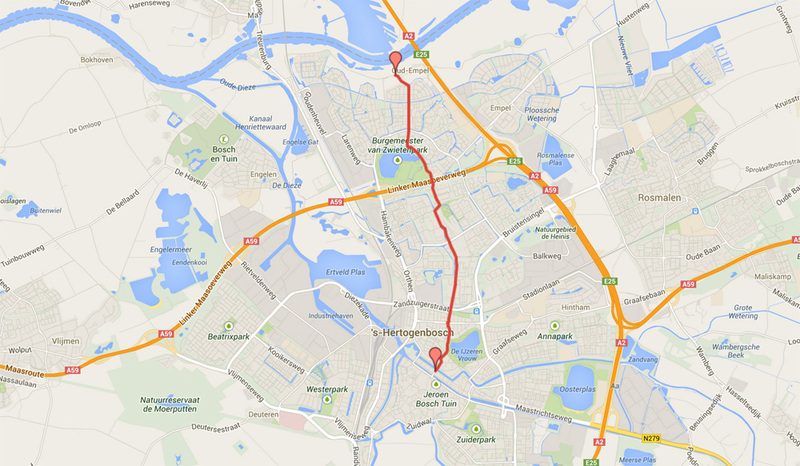 Full 5 kilometre route in almost 16 minutes (real-time). This was the last video I filmed with my old camera, in the summer of 2013. The black spots in the image are dirt in the lens. After seeing this video I got so annoyed that I bought a new camera. I could sit and watch your video all day. Absolutely enjoyed. I don’t get mixing bus lanes with other vehicles, and certainly not bikes. Buses carry many people and deserve priority over private vehicles. Bikes and buses are just a terrible mix – bikes may slow down buses or vice-versa (it depends), but the potential for harm doesn’t bear thinking about. Fail on many levels. Mark, what is the speed limit on the street pictured? Melbourne planners often refuse to implement cycle tracks; they build buffers/space for cars & parking dependent on speed, and claim there is “no space” on what I consider a wide street. Perhaps I am unreasonable? All the streets in this video have a 50km/h speed limit. The default speed limit for the built up area in the Netherlands. This council (Yarra) have done well in that ALL residential streets in the council are 40km/h, including Elizabeth St in the street view (not that all drivers do that). Many arterials are also 40km/h in sections at certain times where it’s needed. However, they also like to plant trees where I believe the bike lanes should go (outside the parked cars) – http://goo.gl/maps/0qFN3. The street is narrower here, which may be the part that is ‘too narrow’ for them. Rat-running is a problem (Melbourne is infuriating to drive around). Lennox St was recently ‘bike prioritized’ with sharrows, originally to my chagrin, but I must admit, it has become quite bike-friendly. Most people drive much slower, and are generally courteous and patient to bikes. It took a little time. I think the people who live in that pocket have come to realize it’s much nicer, especially with a large public housing block and school there. Now seeing more kids along there, including riding to school. This will be extended further south which is great. More public spaces have opened up along here too. Even without taking the parking, you can still put in a cycle track there. Switch the position of the cycle lanes and the parking, take out the central reservation, reduce the speed limit to 50 km/h or less if it is not now, maybe narrow the car and parking lanes, and add a curb between the cycle track and the parking and you should be good to go. The roads shown on the pictures are 50 km/h maxspeed. In the video, the roads that the cycleway is next to after 6:00 are 50 km/h, any roads seen before 3:40 are 30 km/h. I guess that has to be 30km/h, not 50. No, that one is 50km/h. You will not find many cycle tracks along side a 30km/h street. I only know a few examples where the speed has been 50 before. Well, one could consider around 1:10 and 3:30 in this video places where the cycle track is alongside a 30 km/h street. Although it’s probably more correct to say that there are a cycleway and a 30 km/h street parallel to each other rather than one being alongside the other. it’s the car parking here that’s the problem. 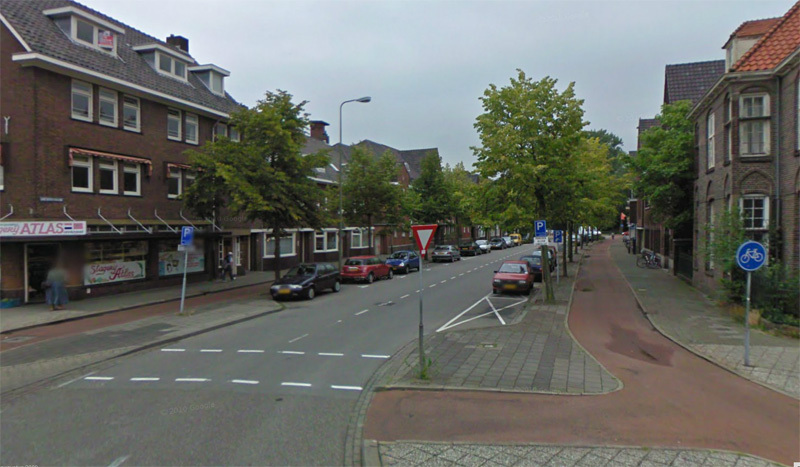 The Dutch would have had the lanes in the following order from outside to inside: Pedestrians, cycles, car parking, vehicles… as that mad lane order in the Googleview above shows, all cyclists are put into the door zone and have no proper escape from motorised vehicles. I agree with your first remark that the car parking is the issue, and that the cycling provision should be on the other side of it, but I don’t think what you describe is what the Dutch would do. As Mark writes, here the road would probably be traffic calmed, with 30 km/h limits, measures to avoid rat runs, and likely no cycleway at all because the road is tamed enough to use. Alternatively, it could be made into a real artery, in which case the car parking would be removed completely and the cycleway separated from the carriageway. Very amusing how foreign countries look upon our cycling infra and even more funny how people keep on saying the Netherlands are flat. Remember 2012 world cup races, the Amstel Gold Race? If you ever want to experience how awesome the Netherlands is to ride, come and visit the south of Limburg! In this area we have climbs that run up from 12 to 22% (make sure to plan the Keutenberg, Eyserbosweg and Doodeman in your route). And about those roundabouts and the cycling lanes; yes it’s nice that we have those BUT: there is a lot of debris on them because cities cut costs and do not clean or maintain them on regular bases. The cycling paths shown in foto’s and video’s are usually in bigger cities. If you live rural like me there are not so much of them around and when; these are mostly overcrowded and used as a footpath too. To be honest I don’t like riding in the city, I rode in Amsterdam, Utrecht and Rotterdam, I consider those the most scary cycling experiences I ever had. So it might be better than in the surrounding countries, but it’s not all unicorns and rainbows like most people think. Visit Limburg in the South of the Netherlands if you have a chance, you’ll love it! It’s interesting that some of the intersections converted to roundabouts seemed to have (according to google maps) 4 lanes. And now they’ve 2 lanes only, on the roundabout at least. Yes that is true. Some of the roads here were changed from 4 lanes to 2 as can be seen in this post. That is actually the road that is shown here in the last two pictures of this post it runs on that junction from left to right. Roundabouts work best if they are single lane roundabouts. One lane roundabouts are also much more pleasant for driving, lots less to worry about. But here in Britain you’ll be hard pressed to find many single-lane roundabouts at all, even with mini-roundabouts like this one http://goo.gl/maps/GOyiv in Tillicoultry. Traffic stacking through a junction comes above all else. Imagine just how choked those roads in that video would have been if every cyclist had taken a car instead… Unfortunately in the UK, the car is still king and takes space away from cycles. It seems that in this area a change has been made from one-way cycle paths to wider two-way cycle paths. Is there any rhyme or reason to when they are chosen? Are they considered safer, faster, easier to use in certain circumstances? Actually, there is a one-way cycle path on the other side of the road from 9:00 onward. I don’t know about any official reason, but as a user, I prefer two-way cycle paths because they allow usage of the other direction for overtaking and such, so the effective width of the cycle path is larger (assuming the width is double that of the one-way path). It might also be more space-economical, because cycle paths nowadays are usually set some distance away from the carriageway. A two-way cyclepath needs only one such section of non-road-surface, two onew-way cyclepaths need two (also because of aforementioned reason, two-way cycle paths can sometimes be narrowing than the double – the minimum in non-exceptional circumstances is 2m for a one-way path, but 3.5 (not 4) for a two-way path, if I recall correctly). First, there actually is a one-way cycle path on the other side of the road from 09:00 onward. Thank you once again for showing us the best of Dutch expertise in cycling infrastructure and telling us about the changes over time. Priority to bicycles should become a global rule all over European cities as there is no other transportation mode as convenient, cost efficient and energy efficient. Cycling is the only tool that can enable us to drastically reduce the catastrophic effects of the over use of automobiles and other motorized vehicles: Accidents, pollution, obesity. This is a good reason enough to unroll the red carpet for bicycle users and make a general rule to give them priority. We have to keep this in mind! If the hill is too steep (Like where I live: It’s called Mount Formose for a reason…) you can always push your bike. It’s sweat free at walking speed. Or get a foldable bike and take it with you in the bus through the steep hill. After that it is so much easy (or it would be if I hadn’t to cycle on the road most of the time). That why in many places I choose the pavement: It is much safer here in many places! I guess not, but do you have some higher quality imagery? The way the person at 5:06 has their arms on the steer makes me suspect that it might be me, but the image is too vague to check that by facial recognition. Cycling in Holland works well probably because the terrain is flat. Dealing with hills is much harder, and the big part of it not the actual effort itself, but the fact that you become sweaty and un-presentable in a work situation. Showers become necessary, which is a whole another hassle. Shower after arriving at work. Better yet: buy an e-bike; hills become much less of problem when assisted by a small electric motor. Might as well just get a scooter. The amount of gas those things burn is really negligible, and you can keep up with cars. I do see electric bikes here once in a while, but there isn’t a wide adoption. An e-bike is bicycle with an electric motor which you can use as and when needed for assistance, while having the option to not use the motor at all. A scooter is not a bicycle with a motor which you can’t not use. I see a pretty big difference there, but it might just be me. A scooter/moped that can keep up with motor traffic requires a helmet, insurance and at minimum a moped license in the E.U. A pedal assist bike that maxes at 25Kph doesn’t need any of those. So a scooter/moped is more expensive/cumbersome to run. At the moment there are no/lenient emission requirements for motorcycles and mopeds and tests show that they are very polluting. More polluting than cars. So fuel use might be low they still pollute a lot, both particle and noise emissions. Just say no to gas powered scooters. Those little two stroke beasts can pollute more than a small car. Of course having no hills helps a lot, but I dare say that if other countries had these cycle paths everywhere, there would be a lot more cycling, hills or no hills. I lived in Zurich for the last half year, and I had to climb some serious hills on my commute. I didn’t find this problematic, because every meter you go up, you’ll eventually go down again. If you simply accept it’s slower to go up than to go down, you don’t even have to arrive all sweaty. And as people say, the absence of head winds makes up for quite a bit of hills. The only thing I really disliked about cycling there was the infrastructure. Growing up in Groningen doesn’t really prepare you for the real world out there I’m afraid. You are right, winds may be even worse than hills. But at least they cool you 🙂 Shorter distances also help. But here in Seattle I once commuted 14 miles one way on a bike. It was fun as a sport in fine weather and daylight, but as an everyday commute year round (in the dark, in the rain, etc) it just wasn’t practical. 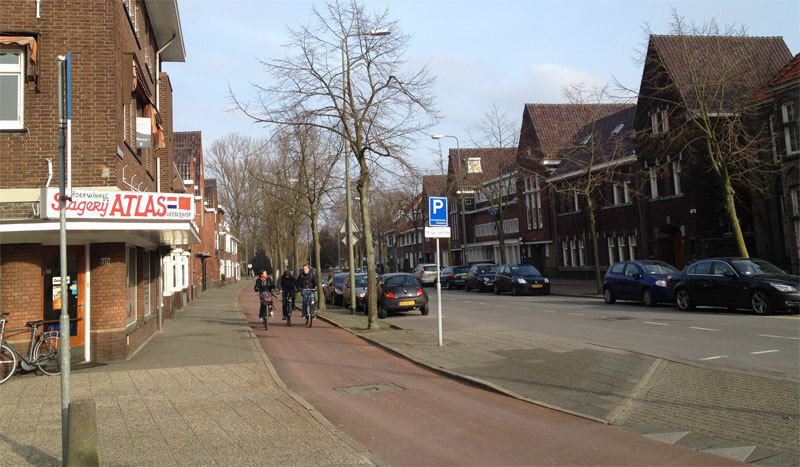 In NL few people cycle the full 14ml/22,5KM one way for their commute. They generally combine such a journey with transit. Most sweat will be on your head, mainly due to helmets, which almost nobody wears in Denmark and the Netherlands and for that matter, the rest of the world minus the US, Canada, Australia and the UK. …Helmets are mandatory in New Zealand as well…. 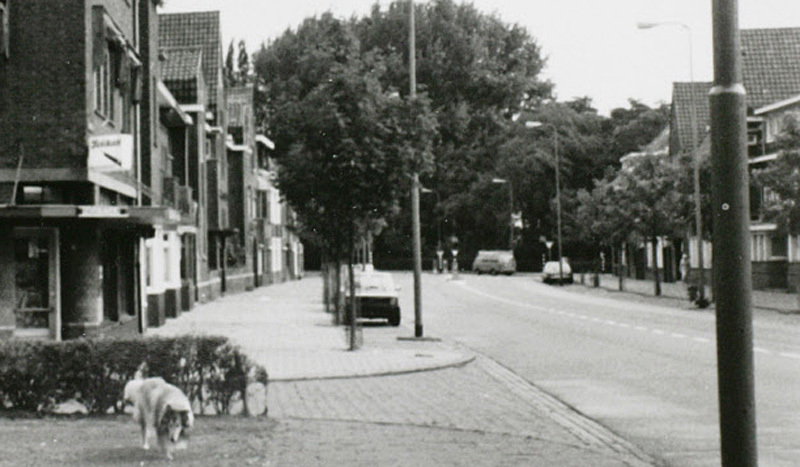 This entry was posted on 30 January 2014 by Bicycle Dutch in Original posts and tagged ’s-Hertogenbosch (Den Bosch), cycle paths, history, junction design, long distance cycle paths, ride.